House Speaker Mitzi Johnson (D-South Hero) joins other House leaders at a Statehouse press conference Wednesday. House Democratic leaders accused Republican Gov. Phil Scott of “shirking his responsibilities” Wednesday by not working with the House Appropriations Committee to find budget cuts. 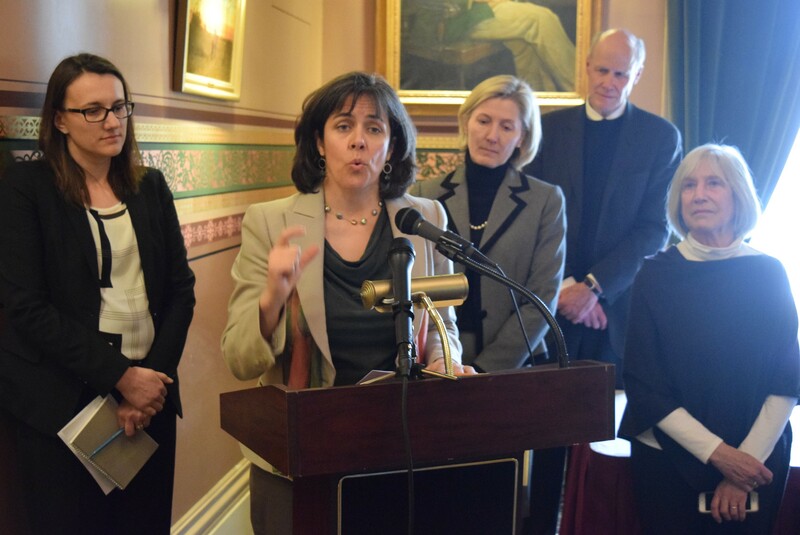 Two days after returning from a weeklong Town Meeting break, House Speaker Mitzi Johnson (D-South Hero) called a press conference to say the budget the Appropriations Committee is building would be better with more cooperation from the governor. “It’s time for the governor to be a leader,” Johnson said. “He’s shirking his responsibilities as governor,” said House Majority Leader Jill Krowinski (D-Burlington). The House Appropriations Committee expects to complete work on its version of the 2018 state budget by Friday, said committee chair Kitty Toll (D-Danville). Toll said she returned from the break expecting Scott’s staff to bring new proposals, but found none. She wasn’t alone in that expectation. Toll sent a memo Tuesday to Administration Secretary Susanne Young asking for a meeting, but she said none has materialized. Instead, Finance Commissioner Andy Pallito told state employees in a Wednesday memo not to negotiate directly with the House Appropriations Committee on budget issues. “If you are contacted, please remind them that the governor put forth a balanced budget, and we should continue to support that budget,” Pallito wrote. Meanwhile, the Appropriations Committee is $16.4 million shy of balancing its version of the budget, Toll said. Members are scouring for savings, looking at the impact of across-the-board cuts while also targeting certain departments, she said. “I will solve this problem but I would be much happier solving it as a team,” she said. The legislature already rejected Scott’s proposal to require local school districts to freeze their budgets and negotiate a 20 percent contribution from teachers for their health coverage. He proposed spending the savings to boost Vermont State Colleges funding and childcare subsidies. Toll said her committee is still considering funding those programs, but would have to find further cuts elsewhere to do that. House Ways and Means Committee chair Janet Ancel (D-Calais) said her committee is working on a plan to produce $5 million in new revenue through increased enforcement of state tax laws. She argued that would not count as a new tax, something the governor has said he wouldn’t support. The Governor presented a balanced budget without raising taxes and fees – including property taxes, despite the misleading rhetoric – without cutting programs that protect our most vulnerable and while making investments in areas that will help grow our economy. ... House majority leadership has made it clear they do not support the Governor’s priorities, or want to work within those parameters to balance the budget. This is a difference in priorities and approach from previous administrations, not a lack of communication. Earlier Wednesday, Scott reiterated in an interview that the House committee has embraced some of his budget proposals, and that he believes a balanced budget could still rely on education savings. “I don’t have to have a Plan B,” he said. A new teachers’ health care plan promises to provide savings, Scott said. Johnson was clear, however, that the legislature has no interest in using savings from education programs, which are funded through property taxes, to pay for general fund expenses, which are paid through income taxes, federal revenue and fees.